Excavators are an essential piece of equipment for any construction, building or mining project. Built for heavy-duty digging and hauling, excavators can boost your team’s efficiency and productivity, while lowering your operating costs. Available in a variety of types and sizes, excavators can be useful for breaking ground, digging trenches, lifting heavy materials, crushing pavement and much more. The right excavator for you will provide ample power and strength to meet your project requirements while operating at maximum efficiency. In this guide, we will cover the different sizes and types of excavators available to help you find the perfect excavator for the job. Excavators come in a variety of configurations to meet different project needs. Some types of excavators are better for heavy-duty jobs, while others offer precise soil extraction or efficient digging and trenching. The various types of excavators available means you can always find the perfect machine for your work site and application. Here are the most common excavator types and their best uses. A standard excavator has a boom, stick and bucket attached to the front of the machine. The bucket arm extends and lowers to dig soil or other materials, then retracts toward the machine to lift the materials. The excavator cab can rotate 360 degrees, allowing the operator to easily dig, move and dump things like gravel or dirt while the machine remains stationary. Also known as crawler excavators, standard excavators run on two parallel tracks that provide traction on sloped or hilly landscapes. Tracked excavators also offer low ground pressure and are well-suited for job sites with soft terrain. Standard excavators come in a variety of sizes, from mini excavators that are perfect for tight job sites to large excavators designed for heavy-duty applications. Buckets and booms for standard excavators are also available in different sizes and lengths to tackle a variety of tasks, including digging, trenching, moving debris, hauling heavy materials and demolishing structures. Standard excavators are useful in construction, landscaping, mining, farming, forestry and other industries that require excavation. Wheeled excavators are a variation of a standard excavator that runs on wheels instead of tracks. These excavators can accomplish the same tasks as a conventional excavator, but are best for job sites with hard terrains like asphalt or concrete. Because of their higher ground pressure and decreased traction, wheeled excavators are not well-suited for soft soil sites or hilly or sloped landscapes. When working on a flat construction site, wheeled excavators offer easy maneuverability and greater speed for transporting materials to dump trucks. Another benefit of wheeled excavators is that your workers can drive them to and from job sites instead of hauling them on a trailer, thus saving your company time and money. Long-reach excavators are another variation of a standard excavator that features an extended boom and arm. These tracked excavators offer a longer reach to tackle large jobs with speed and efficiency. Long-reach excavators are popular for demolition tasks that require precision, or when it is impractical to use a wrecking ball. A long-reach excavator can also enable excavation in hard-to-reach areas, such as along a body of water. Dragline excavators, also called draglines, are heavy-duty machines used for large-scale applications such as strip-mining and canal dredging. Dragline excavators use a bucket system to excavate materials by dragging the bucket along the material’s surface using wire ropes and chains. The bucket dangles from a boom and gets lifted using a hoist rope after excavating the materials. To dump the contents, the dragline excavator rotates to the dump location and then releases the bucket. Dragline excavators are most often useful for surface mining and a variety of large civil engineering projects. Backhoe excavators are another nearly ubiquitous piece of equipment in construction, landscaping and mining. Often confused with standard excavators, backhoe excavators are backhoe loaders with an excavator boom attachment on the back of the machine. On the front of the backhoe is a large bucket or blade used to push, level and move soil and other materials. The excavator arm on the rear of the backhoe functions the same way as a standard excavator, except rather than rotating a full 360 degrees, backhoes only rotate 200 degrees. A benefit of choosing a backhoe with an excavator attachment instead of a standard excavator is that backhoes are incredibly versatile machines. In addition to accomplishing many of the same digging tasks as a conventional excavator, backhoe excavators can also level and grade soil and move larger volumes of materials quickly. Backhoe loaders can also pair with many other work tool attachments to further expand their capabilities. Hydraulic shovels, also called power shovels, are heavy-duty machines designed for mining and other intense digging tasks. These powerful machines have a lifting arm and large bucket to haul rocks, minerals, soil and other heavy materials. Hydraulic shovels can be oriented in the same way as standard excavators, with the bucket facing toward the machine’s cab, or can have a bucket that faces away from the cab. Suction excavators are a less common type of excavator that can loosen and remove soil precisely. These excavators use high-pressure water to blast materials and soil loose, and then remove them using a suction pipe. The edge of the pipe also contains sharp teeth that break up the material further while removing it. Because these excavators allow for precise removal of materials, they are often ideal in situations that require careful and safe removal of materials without damaging underground components. These various types of excavators can increase your productivity on any digging, trenching or excavation project. In this piece, we will focus on tracked and wheeled excavators, as they are the standard type of excavator used for a variety of jobs. Standard excavators are versatile machines on their own, but work tools and attachments can extend these capabilities even further. If you are looking for an excavator that can do it all, look for one that supports a variety of work tools. Here are a few popular excavator work tool attachments to increase the productivity of your excavator. Buckets: Buckets are the most standard excavator attachment, but not all buckets are equal. Choose between slim buckets with teeth for digging and trenching, or wide, smooth buckets for scooping and lifting materials. Thumbs: Adding a thumb attachment to your excavator can increase its bucket capacity and extend its material handling capabilities. Thumbs help secure the materials you are excavating and allow your excavator to grip larger pieces. Augers: Featuring a hydraulic spiral blade, auger attachments allow you to dig holes quickly and efficiently. In landscaping and construction, auger attachments can dig consistent holes for fence posts, foliage or building supports. Hammers: When breaking up pavement or other hard surfaces, excavator hammer attachments can expedite the demolition process. Rippers: Rippers are another excellent attachment for tearing through tough materials. These durable tools can break up frozen ground or demolish structures. Couplers: When working with a variety of attachments, couplers allow you to switch between work tools quickly without needing a crew. Couplers can help maximize the versatility of your excavator and boost your team’s productivity. By adding work tool attachments to your excavator, you can tackle a wide variety of tasks with a single machine. Excavators come in a variety of sizes to suit every project, from backyard landscaping to large-scale commercial construction. Understanding the benefits and challenges of different sizes of excavators can help you make an informed decision about the right size excavator for your job. There are three primary excavator size classes, according to the weight of the machine. Mini excavators are any excavators that weigh less than seven metric tons. These small excavators are sometimes called compact excavators, and are perfect for tight job sites. Mini excavators can maneuver in small spaces for landscaping tasks such as digging holes for trees or trenches for pipes. Mini excavators often have zero or near-zero tail swing, so operators can use them comfortably around buildings and other structures. For job sites with many pipes or gas lines underground, mini excavators offer greater precision than larger digging equipment. Another benefit of mini excavators is that they are easy to transport on a truck or trailer and require less fuel than larger excavators. Because they are lighter, mini excavators can operate on soft terrain without tearing up the ground, or on finished sites without damaging the sidewalks or pavement. However, mini excavators are not as powerful as larger excavators and may not be able to provide the necessary dig depth or lift capacity for every job. Standard-sized excavators weigh between seven and 45 metric tons. These versatile excavators are the most common size for commercial construction projects, and offer enough power and hauling capacity to handle a variety of tough jobs. Many hydraulic standard excavators can also support a variety of work tools, so contractors can customize their excavator to suit their project needs. Standard excavators are still easy to maneuver and can significantly increase productivity on a job site. However, these more massive excavators may cause damage to finished sites or soft soil. Depending on their size, reach and tail swing, a standard excavator may also be challenging to operate in tighter spaces. Conventional excavators that fall on the heavier end of this excavator weight class could also pose transportation and storage challenges. You may sometimes see standard excavators broken into two excavator weight classes — small and medium excavators. Small excavators are those at the bottom of this size class that weigh between 7 and 10 tons. The small size and low tail swing of midi excavators mean they are useful for many of the same tasks as mini excavators, but offer more power, reach and dig depth. These hefty excavators weigh more than 45 metric tons and are suited for heavy-duty jobs. Large excavators provide serious power for major commercial construction projects or large-scale demolition. Large excavators can be valuable for digging foundations for shopping centers or apartment complexes, or moving large volumes of soil for civil engineering tasks. Although transportation and storage of large excavators can be challenging, a large excavator may be worth the investment if you need to tackle serious excavation projects with ease. With so many excavator types and sizes available, choosing the right excavator for your project requires some careful consideration. The right excavator will provide the power and strength you need to get the job done efficiently while offering the lowest possible operating cost. When you take time to choose the right size excavator, you can increase your productivity and boost your company’s profitability. If you are renting an excavator for a single project, evaluate the requirements for that project and work site when choosing your excavator. If you are purchasing an excavator for long-term use, consider the types of projects your company typically takes on. Choose an excavator that will meet your common job requirements and perform well on the sites where you most often work. To make the most of your investment, look for an excavator that can also keep up with your company’s growth in the future. Consider these factors when determining what size excavator you need. First, consider the size and layout of your job site. Will you be working on a small site with tight spaces and obstacles to navigate, or enjoying a wide-open plot of land with no interferences? If you are working in a small space or on a site with many hazards, a compact mini excavator may be the right choice. A smaller excavator may also be a smart choice if your job site has a lot of underground obstacles, such as pipes and gas lines. Mini and small excavators will have smaller buckets, as well as more precise controls to safely avoid underground hazards while excavating efficiently. If your job site has more space to maneuver, you may be able to use a standard or large excavator comfortably. However, remember to account for future hazards that may appear as your construction project progresses. The tail swing of an excavator also impacts how easily it can navigate in tight spaces. Larger excavators typically have a larger tail swing, as they require more counterweight to remain balanced. This rear extension can pose problems when working near walls or buildings and can also harm workers if not operated safely. Many mini and small excavators offer zero or near-zero tail swing, which means they can rotate safely without damaging surrounding trees or structures. Excavators with zero tail swing are popular for urban or residential work sites. However, to provide stability while turning, excavators with zero tail swing typically have a larger footprint and tracks that are wider apart. Different types of excavators work better on various terrains. Tracked excavators offer excellent traction and stability on hilly and soft ground, while wheeled excavators work best on hard and flat surfaces. However, the weight of an excavator also impacts how well it performs on specific terrain. Large and standard excavators can exert a lot of pressure and tear up a job site if the ground is weak. For some jobs, this may not be an issue if the earth will get leveled at a later stage of the construction project. However, when working on a finished site, such as a backyard or other residential space, it requires greater care to prevent damage to the terrain. Mini excavators are safe to use on finished sites without harming the ground. When considering the weight of an excavator, account for the maximum operating weight, rather than how much the machine weighs alone. The operating weight will include the weight of both the excavator operator and the load the machine will be hauling. After accounting for your work site conditions, consider the typical tasks your excavator will need to perform. The right size excavator for your company will be able to handle your digging, lifting and hauling needs with ease and efficiency. If purchasing an excavator for long-term use, look at the requirements of past projects to get a sense of your future needs. Account for any potential growth, and choose an excavator that will suit your company’s needs for years to come. 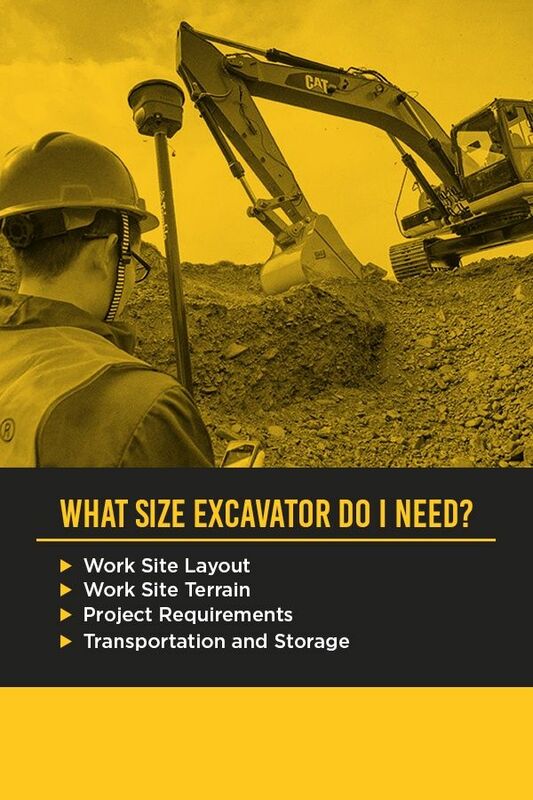 Here are a few project requirements to look at when choosing the right excavator size. Dig depth: Consider the maximum digging depth your projects require for laying pipes, planting trees or digging trenches. Make sure your excavator can achieve this dig depth, or whether you can upgrade it with a longer boom to reach the depths you need. Reach: The boom reach of an excavator determines how far away your excavator can dig while remaining stationary. A longer reach can slow the excavation cycle time, but may be desirable for projects where accessibility is a challenge. You can also upgrade some excavators with longer booms to extend their reach if needed in the future. Lift height: If your projects require loading materials onto structures or into massive trucks, choose an excavator with sufficient lift height. Load capacity: Excavator load capacities can range from a fraction of a cubic yard for mini excavators to several cubic yards of material for larger excavators. An excavator’s load capacity determines how much material you can move in one cycle, which impacts your operating speeds. Look for an excavator with a large enough bucket capacity for your digging needs. Load weight: In addition to material volume, consider how much weight your excavator will need to lift. If you often excavate heavy or dense materials, make sure your excavator can withstand the load weight necessary to meet your project’s demands. The right size excavator will be able to meet all your project requirements while safely maneuvering around your job site. If an excavator cannot match your job needs, consider upgrading it with a new boom or bucket to extend its capabilities. Another important consideration when choosing between the different sizes of excavators is the transportation and storage requirements of each size. Transportation of large and standard excavators can be expensive, as it requires special permits and equipment. If you plan to transport your excavators on your own, make sure you have the vehicles and trailers to do the job, as well as drivers with the required licenses for moving heavy equipment. You may also choose to work with an equipment transportation company to reduce the transportation costs of carrying your large excavators. Standard-sized trailers can move mini excavators, but you may still require special permits or licenses, depending on your state. If you plan to purchase an excavator for long-term use, make sure you have the appropriate storage facilities for the size of excavator you choose. You can also rent a storage space during the offseason to cut expenses. For infrequent use, renting an excavator instead of buying may help you save money on storage and transportation costs. As the leading manufacturer of heavy equipment for construction and mining, Caterpillar® offers a wide variety of excavator sizes and types for any application. Cat mini excavators are available in several different models and are perfect for landscaping, urban and residential construction and small building projects. Cat mini excavators offer power and durability in a compact machine that is easy to control precisely. Choose between standard, zero and near-zero tail swing options to suit your work site and project needs. Cat standard excavators supply the power you need to tackle a variety of tough jobs, from trenching to materials handling. Designed for speed and efficiency, Cat standard excavators can maximize your productivity and reduce your operating costs. Our durable excavators also require less maintenance and reduced fuel consumption. Cat next-generation excavators take this exceptional performance to the next level, offering even better efficiency and productivity than ever before. Available in 20-ton and 30-ton models, Cat next-generation excavators can increase efficiency by as much as 45 percent, while lowering fuel consumption up to 25 percent and reducing maintenance expenses by up to 20 percent. Our next-generation excavators can help you meet your production goals, slash your operating costs and tackle any tough job that comes your way. For the most challenging jobs, Caterpillar offers several heavy-duty large excavators for construction, mining, farming and more. These industrial workhorses offer serious digging and lifting capabilities to make short work of any excavation project. Despite their massive size, Cat large excavators still provide the excellent fuel efficiency and performance Caterpillar is known for. If you are looking for a reliable, efficient and powerful excavator, look no further than Gregory Poole. We offer a wide variety of mini, standard and large Cat excavators to meet and exceed your project requirements. With both new and used Cat excavators for sale, you can find an excavator that fits both your needs and your budget. Because Cat builds durable, built-to-last equipment, many of our used excavators offer the same excellent performance and durability you can expect from our new machines. For even more flexibility, consider renting an excavator from Gregory Poole. When you rent a Cat excavator, you can enjoy improved performance and efficiency at a fraction of the cost. With short- and long-term rental options available, you can rent an excavator for a single project or an entire season. For more information about new, used or rental excavators from Gregory Poole Equipment Company, contact us today.